Tuscaloosa City Hall is located at 2201 University Boulevard, Tuscaloosa, AL 35402; phone: 205-258-5311. Photo: Dearing-Bagby House, 421 Queen City Avenue, Historic American Buildings Survey [HABS AL-230], Jet Lowe, photographer, 1993, memory.loc.gov, accessed August, 2012. Circa 1836 homes built by James H. Dearing. Known as the Governor's Mansion even though it was never owned by the State, it was owned and occupied for a period by Governor A. P. Bagby. A post office and station on the Mobile and Ohio and the Alabama Great Southern railroads in the south central part of Tuscaloosa County. It is located on the Warrior River, at the falls, about 60 miles southwest of Birmingham and about 175 miles northwest of Montgomery. In 1809, when the government at Washington was establishing trading posts throughout Mississippi Territory, a Creek chief, by the name of Ocechemotla, obtained the consent of the Choctaws to locate a settlement known as Black Warrior Town at the falls of the Warrior River. This settlement was visited by Tecumseh, the Shawnee chief, on his return from the Alibamo towns. This expedition had been undertaken with a view to enlisting the Southern Indians in a general uprising against the whites. After the massacre at Fort Mims and the sanguinary events following in its wake, the garrison at Seminole Fort at Warrior Town was captured and the settlement was destroyed. In 1815 Isaac Cannon and John Wilson came to Warrior Town selecting an old Indian field, near Seminole Fort, as a place of settlement. The early inhabitants came to this section from the upper districts of the Carolinas and Georgia, first migrating to Tennessee and later to Alabama. Patrick Scott, Jonathan York, John Barton, Joseph Tilley and William Wilson were among these early settlers. William Wilson built the first log hut near where the old State capitol now stands and Jonathan York built the first board shanty in the county of Tuscaloosa. The first frame residence of any size was erected by William R. Colgin and the first brick residence by Dr. James Guild. Tuscaloosa was incorporated by an Act of the general assembly of Alabama, approved December 13, 1819. On January 12, 1828, a new charter was granted and this and all subsequent charters confine its limits to sections south of the Warrior River. The population in 1817 numbered about 200 people and had increased to 600 at the time of the land sales in 1821. 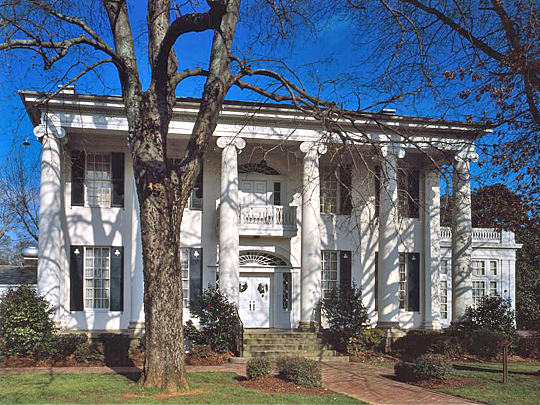 In 1826, the State Capitol was removed from Cahaba to Tuscaloosa where it remained until its removal to Montgomery in 1845. On December 29, 1827, Tuscaloosa was selected by the general assembly as the location of the State University. Thomas McAdory Owen, LL.D., History of Alabama and Dictionary of Alabama Bibliography, Volume II, The S. J. Clarke Publishing Company, Chicago, 1921.